Don’t be scared off by the long ingredient list. 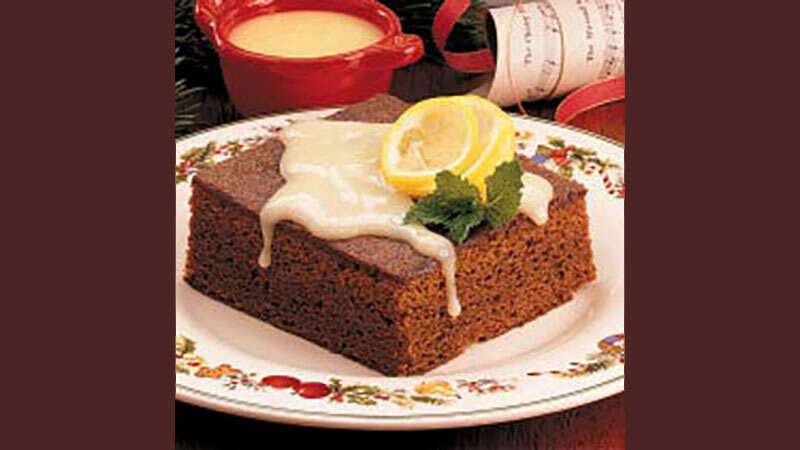 This is an easy to follow recipe that will result in delicious, old fashioned, feel good gingerbread. Directions-Grease 9x9x2″ baking pan. Preheat oven to 350 degrees. Sift flour, sugar, baking soda, salt, cinnamon, ginger and cloves into a large bowl. Stir in wheat germ. Beat eggs in a medium size bowl until frothy. Stir in buttermilk, molasses and oil mixing well. Stir liquid ingredients into dry ingredients mixing well. Pour into prepared pan and bake for 35 minutes or until top springs back when pressed. Cool on wire rack. Combine sugar, cornstarch and salt in small saucepan mixing well. Stir in boiling water and bring to a second boil stirring constantly. Lower heat and simmer, stirring until sauce thickens and is clear. Stir in butter, lemon rind and juice. Pour over warm Gingerbread. Garnish with additional whipped cream if desired. Enjoy this winter treat!